Art Supplies CAN Be Funny! Being a long-time member of Elwood Smith's Punsters Society, I've heard more than once that "a pun is the lowest form of humor, but a poem is verse." But back in the Paleolithographic Era of Illustration, I found a way to lower the humor bar even more when editor Jill Bossert and publisher Jerry McConnell experienced temporary insanity long enough to invite me to conceive and design the book for the Society of Illustrators second Humor Show, as well as serve on the jury. What's that? When exactly was the show? 1988, okay, mister? Now you know... so don't ask me again! Anyway, I asked best pal Jim Wilson to design some Johnson Smith-style art supplies for the front of the book, and this is what he came up with. I still hand out a trick push pin now and then to a "rookie". What a riot! 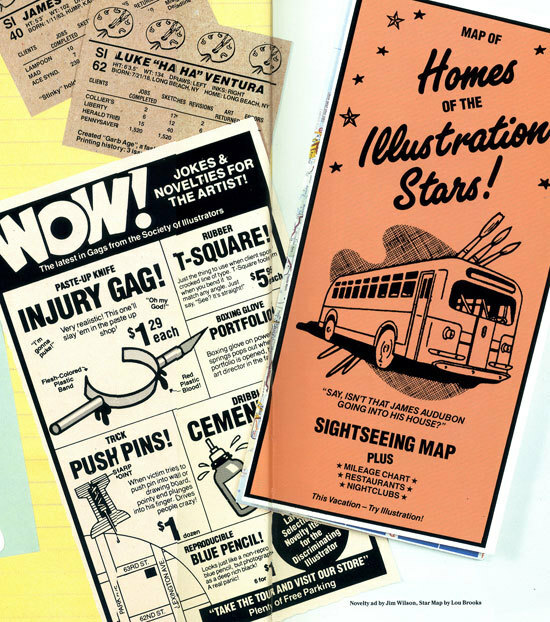 A more inclusive view of the spread is shown below, featuring a map of illustration stars' homes as well as a couple of illustrator bubble gum cards. By the way, I did the best I could with patching together flatbed scans of such a large book, so hope it's satisfactory. Where can I send my money? I want me some of those there trick push pins! ...wait, I'm a freelancer - I work alone! Well... after all the Xylene and Spray Mount exposure I've had I'm sure it won't be long until I forget I bought them. Let the hilarity ensue! Wait! they are missing the trick paper cutter that cuts off your fingers! I am loving your site because and trying to get my brother to go through my parent's garage where my dad has stashed neary 4 decades worth of graphic design materials and send you some photos. It's seriously the Let's Make A Deal collection of forgotten supplies. 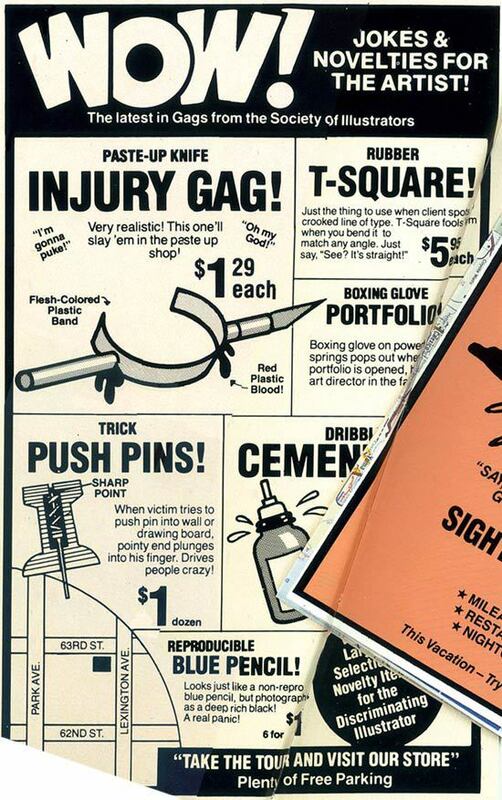 For my $$, the best art supply gag is rubber cement boogers. Nice old-school art supply trick: take a piece of old, black negative film, and cut into an irregular shape that looks like an ink spatter, lay it across someone's desk, artwork, car hood, etc. Works every time! Also, if you have a lot of flying insects in your office, hit 'em with a little spray mount in-flight! Great fun! Back in the day we used to take an X-Acto knife, put the #11 blade in backwards so the point is in the clamp and throw it at an unsuspecting co-worker. Watch them duck and listen to the screams!! Great fun! Oh, and by the way -> GREAT SITE!